Info William Frank Buckley Jr. American journalist, founded National Review, a prominent conservative magazine, in 1955, and the television show Firing Line in 1966. Born in New York City (the sixth of 10 children) and a 1950 graduate of Yale University, Buckley briefly served in World War II and worked for the CIA. He then worked as an editor for The American Mercury in 1951 and 1952 before founding National Review, which he edited for many years. In 1965, Buckley ran for mayor of New York City as the candidate for the newly formed Conservative Party because of his dissatisfation with Republican candidate John Lindsay. He finished third with 13% of the vote. In 1973, he served as a delegate to the United Nations. Buckley is a nationally syndicated newspaper columnist whose work appears in more than 300 newspapers and author of numerous books, both fiction and non-fiction. His writing style is characterized by its strict, correct grammar, strong opinions, and use of uncommon words such as eschatological. Buckley is the author of a series of novels using the character of CIA agent Blackford Oakes. 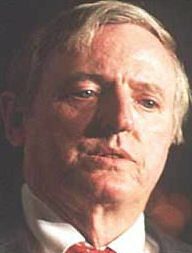 In 1991, Buckley received the Presidential Medal of Freedom from President George H. W. Bush. Moderator of the first presidential primary debates of both the Democratic and Republicans in 1987.